Seven men, three vehicles, and 5,000 kilometers of ice. It took 20 days for the Icelandic-American expedition to drive from the southern coast of Greenland to the land’s northernmost spot and back. One of the team’s special vehicles built by Arctic Trucks was equipped with Nokian Hakkapeliitta 44 tires, which are tailored for real winter. This wild adventure in the uncompromising Arctic climate was a tough test for the participants and equipment alike. The Nokian Hakkapeliitta 44 tires faced a severe test. The adventure, titled Expeditions7, started from Isortoq in the southern tip of Greenland and headed north toward Wulff Land at its northern extreme. For the most part, the journey took place on top of the continental glacier, which is several thousand kilometers long and over three kilometers thick at certain points. - The hardest part was setting off and finding a safe route from the sea ice onto the thick continental ice sheet, said Emil Grimsson, one of the founders of Arctic Trucks, who also took part in the expedition. - We were driving on the thin river ice when one of our vehicles fell in. Fortunately, it was the worst thing that happened, and we were able start our journey only a few days later than planned. - Seeing the size of the glacier in its entirety was breathtaking, Grimsson said. - Arriving in Wulff Land after days of driving on ice was also memorable. The place was impressive…almost surreal. I’m not sure anyone has ever driven a car that far north. Greenland's barren, beautiful and untouched landscape is not an easy route, even for the most experienced winter drivers. That’s why the expedition relied on state-of-the-art equipment to survive glaciers, rocky terrain and soft snowbanks. The team chose three custom-built vehicles from Iceland-based Arctic Trucks – the same types of vehicles used for Antarctic expeditions. 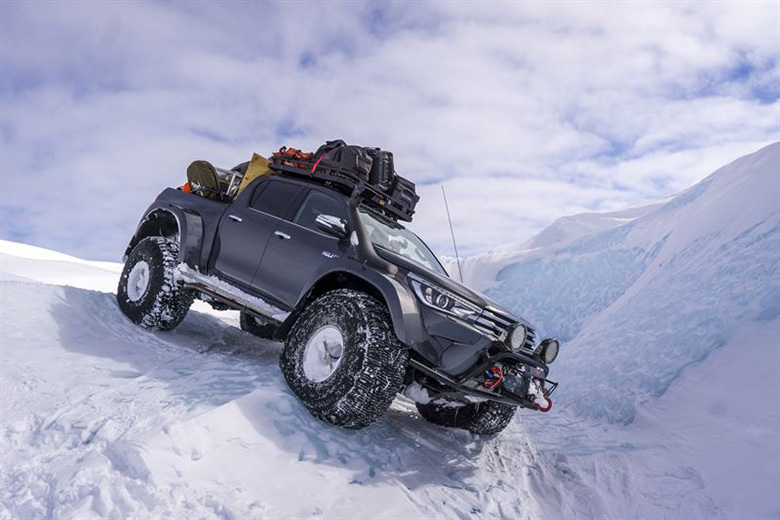 The newest of the vehicles was equipped with high-performance Nokian Hakkapeliitta 44 tires from the world’s northernmost tire manufacturer, Nokian Tyres. The tire has a tread compound tailored to offer both grip and durability in very cold conditions. - I wanted to use Nokian Hakkapeliittas based on my earlier experiences with them. These tires master extreme conditions and work unbelievably well even in temperatures as low as -40 degrees, Grimsson said. One Nokian Hakkapeliitta 44 tire weighs 70 kilograms and is over one meter in diameter. The rugged tire came to life a couple of years ago as the result of a long cooperation between Nokian Tyres and Arctic Trucks. - In soft snow, you need large tires with sufficient room for air, Grimsson said. - You can adjust the length of the tire’s contact surface by regulating the inflation pressure. A wide tire has better load-bearing capabilities and will not sink as deep into the snow as a narrow tire. - Luckily, we ended up consuming less fuel than we had estimated, Grimsson said. - The Nokian Hakkapeliittas have good fuel economy. - This was the first time we had ever pulled fuel in bladders on sledges behind the cars, Grimsson recalls. - We struggled to secure the bladders on the sledges and to keep the sledges from falling apart on the hard-packed terrain. - Truly a once-in-a-lifetime experience, Grimsson said. - Trips like these take you to another reality. You can only focus on the here and now, enjoy the moment and forget about everything else.